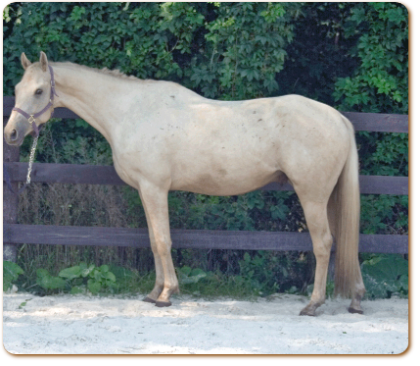 Tinker's Trinket (barn name Bianca) is a palomino Thoroughbred mare born June 9, 2007. Bianca is out of Driving Rosa Wild ( a Sadler's Wells granddaughter) and by Guaranteed Gold. Bianca is a full bodied mare that is extremely athletic and enjoys the company of people.